This F1 season is a head to head contest between motorsport’s Top 2 Teams: The Scuderia and The Silver Arrows. At the weekend Silverstone we saw Ferrari (NYSE:RACE) respond formidably to the recent gainers made by MercedesAMG. Lewis Hamilton took Pole for MercedesAMG with a very fast lap, but, the Ferrari with a new floor and diffuser, and an engine that is producing power power proved to be the faster car in the race. Sebastian Vettel sped away in the early stages and the new tech was the Key to his victory. With many of Silverstone’s once fast sweeps: Abbey, Copse, Maggots now essentially straights, in that they are flat-out in Top gear for every car, the Key differentiating factor here between cars has shifted from high speed down-force to engine power and aerodynamic efficiency, i.e. how much drag the car carries for a given amount of down-force. Watching the race from the sky was telling. In France, MercedesAMG debuted their Phase 2.1 engine and in Austria a significant aero upgrade around the sidepods, with the combined effect of these appearing to have put them clearly ahead of Ferrari, not so. Ferrari’s updated Silverstone floor featured revised slats and a Toro Rosso-like upturn on the floor edge, showing a different approach to what was seen in Shanghai. The Ferrari development path this year has been aggressive delivering results, and the Silverstone update hit hard. This comprised enhanced versions of the longitudinal slats introduced in Spain running the full length of the outer edges of the floor. This increases the power of the vortices within the outer part of the underfloor. These spinning circles of air effectively seal the gap between the floor and the ground, preventing the airflow that is rushing through the central part of the floor from spilling out the sides i.e. they do the job that the long-since banned nylon sealing skirts used to do in the late ‘70’s and early ‘80’s. This tech increases the negative pressure of the floor, pulling the car down harder on its tires. So, the better the seal, the greater the down-force, yes? 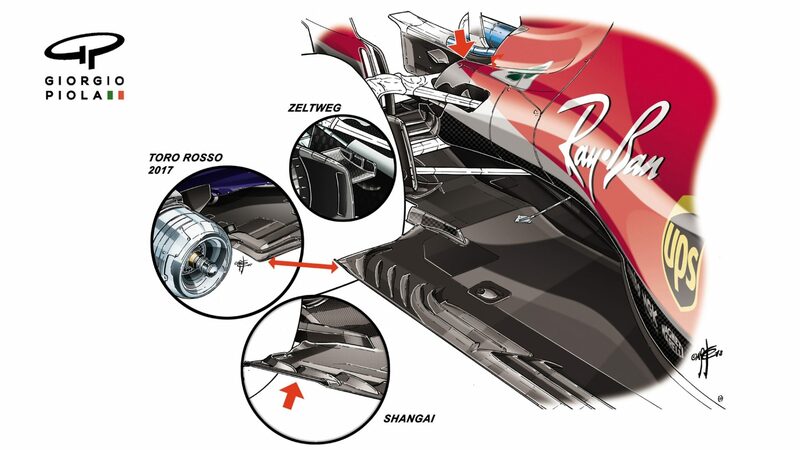 The new vortex-enhancing slats will have changed the pattern of the airflow, and so accompanying changes have been made to the shape of the diffuser. There was also a more complex, multi-element, wiglet as part of the rear brake duct assembly. Gosh are these racers complex!